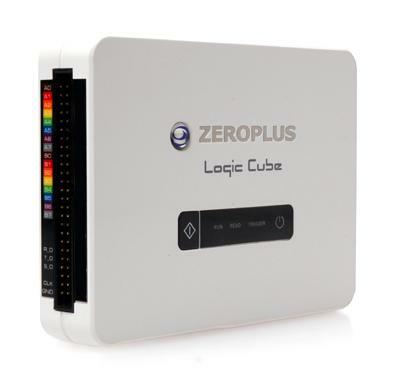 The Zeroplus LAP-C (162000) is a 16-Channel, PC-based Logic Analyzer that features powerful protocol analyzer capabilities. The standard package includes the UART, IIC, SPI, 7-Seg, 1-Wire, CAN2.0B, Microwire, SSI, Manchester, Miller, LCD1602, IRDA, DigitalLogic, 3-Wire, ArithmeticalLogic, UpDownCounter, USB1.1, JTAG2.0 & PS/2 Protocol Analyzer plug-ins. You will also receive printed instructions on how to activate the remaining protocol decoder plugins of your choice for free. This is the List of all available protocol decoder plugins. The Zeroplus patented waveform compression technology increases the effective sample memory capacity far beyond the physical 32MBit. All 16 channels of the LAP-C (162000) can achieve a compression rate up to 255× depending on the data content, allowing you to obtain considerably more sampling data.